The food has been phenomenal, as you can imagine, and the reading exceptional. I made it a point to bring NO children's/YA books on this trip because I just so needed a cold turkey break from all the coming of age and angst. So I started off with Fifth Avenue, 5 AM: Audrey Hepburn, Breakfast at Tiffany's, and the Dawn of the Modern Woman by Sam Wasson (HarperStudio, 2010). I'm a die-hard Audrey Hepburn fan* and this was the PERFECT book for vacation reading. You know when you have those fantastic symbiotic moments when you read a book that so perfectly fits with your mood and your life-place? That was this one for me. And a nice outcome of this book is that the bibliography/notes are exceptional - I added about 5 more books to my to-read list after I finished. 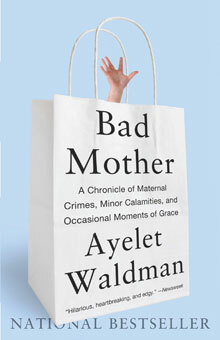 Then, at the recommendation of my dear friend Amy Cray, I read Bad Mother: A Chronicle of Maternal Crimes, Minor Calamities, and Occasional Moments of Grace by Ayelet Waldman (better known as the author who told the world that she loved her husband more than her children and received a hailstorm of crap for it). Again, right book, right moment. It was funny and fresh, and it was so honest that there were moments where I wondered where Waldman's mind was when she decided to commit some of her thoughts and experiences to the page. Naturally, though, it made for a more compelling and authentic read and I loved every minute of it. Marcelo in the Real World? How did that get in my bag?! I wasn't going to bring a kids' book! But I finally, finally snagged a copy of this at ALA and decided that I needed to jump on the bandwagon. I grumbled at first - I felt like Francisco X. Stork's story starts off slow. Not by any fault of the writing but because, as the reader, you're inside Marcelo's head so it takes a bit to understand the rhythms and nuances of his autistic thought patterns (at least it did for this reader). But then it takes off and soars. Halfway through the story, I wasn't paying attention to a single word Adam was saying to me and it took several "Hello? Helllooooo, Laura! "s before Adam could get me to even look at him. A beautiful, gorgeous, lush read. And I would occasionally close the book, just to gaze at the cover. One of my favorite covers of last year, for certain. I didn't anticipate reading this one on my vacation but, boy, am I glad I did! Now back to 97 Orchard! Eat, drink, and embrace summer reading! * Funny story: at IRA in Chicago back in April, we took a number of our authors to dinner. A colleague of mine and a well-known author/illustrator got into an in-depth and passionate discussion of all things Marilyn Monroe. I mean, they're fans. As a avid classic movie viewer, I piped up with this gem: "Marilyn is okay and all, but I'm SUCH a fan of all things Audrey." They looked at me like I had sprouted goat horns, wrinkled their noses, and kept talking about their favorite gal. In hindsight, I realize my gaffe: all classic film stars are not equal. I should have known better. Luckily, later on, the discussion shifted to Cary Grant and we all agreed and gushed about his class and his beauty. "You know when you have those fantastic symbiotic moments when you read a book that so perfectly fits with your mood and your life-place?" - yes, I do; those are the best. 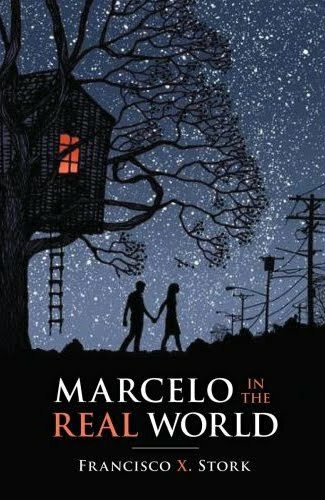 I just brought Marcelo home from the library...I've been hearing such terrific things about it, so I'm excited to read it.